- Threats to citizens' basic rights and freedoms and to the neutrality of Internet could be voted without any safeguard in the EU legislation regarding electronic communication networks (Telecoms Package). 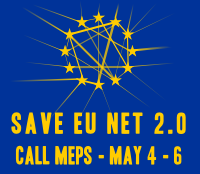 EU citizens have two days to call all Members of the European Parliament (MEPs) to ask them to vote for the “Citizens' Rights Amendments”, in the second reading of the Telecoms Package. These amendments include all the safeguards that were removed in the “compromise amendments”, as well as provisions protecting against “net discrimination” practices and filtering of content. In the Harbour report, amendment 166 was replaced by an empty version that has no more protective value. Some very light protection against “net discrimination”, where operators can choose what content, services and applications may be accessed or used through their networks, was also completely neutralized. The only protection left is now customer information through the contracts, which is a scam because customer and competition law cannot regulate fundamental rights (and they failed to regulate mobile communication networks, which are still agreed as cartels in most member states). In the Trautmann report, amendment 138/46 was turned down into a weaker version (yet still a clear political sign and legal reminder against the French “three strikes” HADOPI bill), that may require interpretation from an EU court of justice, and years of challenge, to counter “graduated response”/“three strikes” schemes. The Citizens' Rights Amendments correct all these problems. They restate amendment 138/46, article 32a (amendment 166 from first reading), they remove any open door to “three strikes” policies and protect against abusive “net discrimination” practices by operators. “All MEPs must vote for the ‘Citizens Rights Amendments’, because safeguarding EU citizens fundamental rights and freedoms is the most important mission of the European Parliament. Protecting basic rights must not be left to consumer and competition laws. There can be no compromise on basic principles, certainly not merely to make the EU procedure go faster. The image of the Parliament, a few weeks before the elections, is at stake” explains Gérald Sédrati-Dinet, analyst for La Quadrature du Net. It is urgent to contact ALL Members of European Parliament (MEPs) to inform them about these issues, and advise them to follow La Quadrature's voting lists. They must understand that a few weeks before the elections, EU citizens are watching and scoring their votes in Political Memory. “Call your MEPs and tell them to vote to protect Citizens rights. Direct opposition to the Council of EU is preferable to steps backwards on fundamental rights and freedoms, especially concerning Internet, which is so vital in structuring the future of our societies. Moreover the Citizens' Right Amendments do not directly oppose to the compromise negotiated with the Council, they strengthen it.” concludes Jérémie Zimmermann, co-founder of La Quadrature du Net. Du kan finde en liste af danske EU-parlamentsmedlemmer og deres telfonnumre og email-adresse her.